At sunrise last weekend and again today, I went to Huntley Meadows Park in northern Virginia with the hope of seeing and photographing Wood Ducks. I heard and confirmed on eBird that they were there. 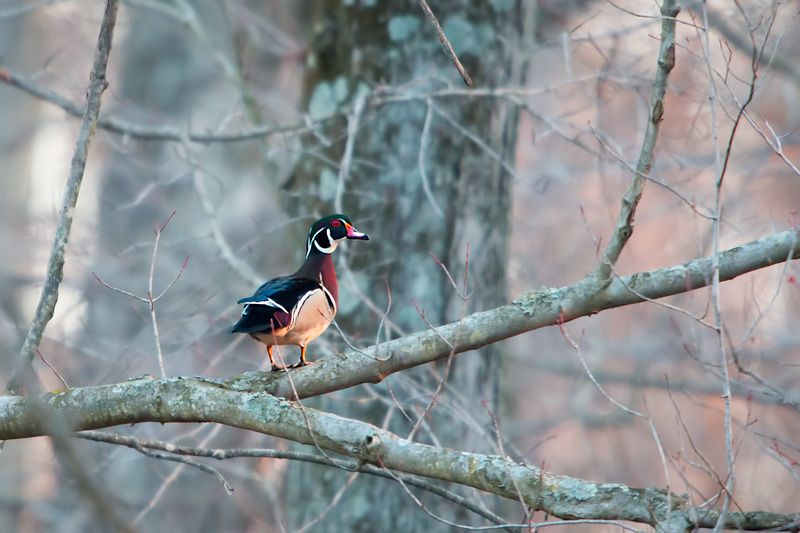 If you follow my blog, you know that Wood Ducks are high on my list of photography goals. The reason is simple: the male Wood Duck is one of nature’s most beautiful waterfowl with its iridescent colors and bright red eyes and, although not nearly as colorful, the female is very attractive as well. They are found only in North America and are second, only to the Mallard, as the most hunted duck, which is probably why they seem to be so timid and quick to hide or leave when people approach. That has been my experience, making photographing them very challenging. Huntley Meadows is located in Fairfax County in northern Virginia within a short drive to Washington, DC. It is a natural oasis in the middle of a very dense suburban area of houses, condos, apartments, strip malls, fast food restaurants, highways, and an airport close enough that the sound of arriving passenger planes is often very loud, partially drowning out the sounds of Nature. 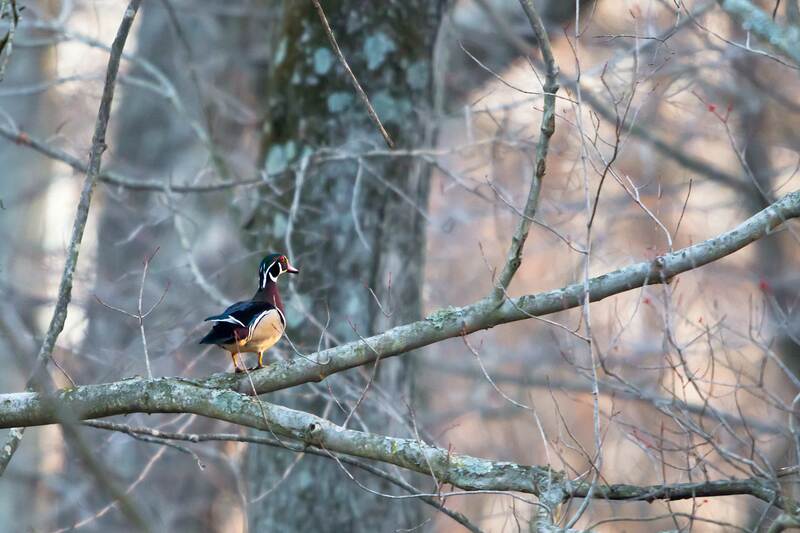 The park consists of 1,500 acres of unspoiled meadows, freshwater marshes and wetlands, and hardwood forests, which is the perfect habitat for Wood Ducks. Most wildlife are very active in the early morning. 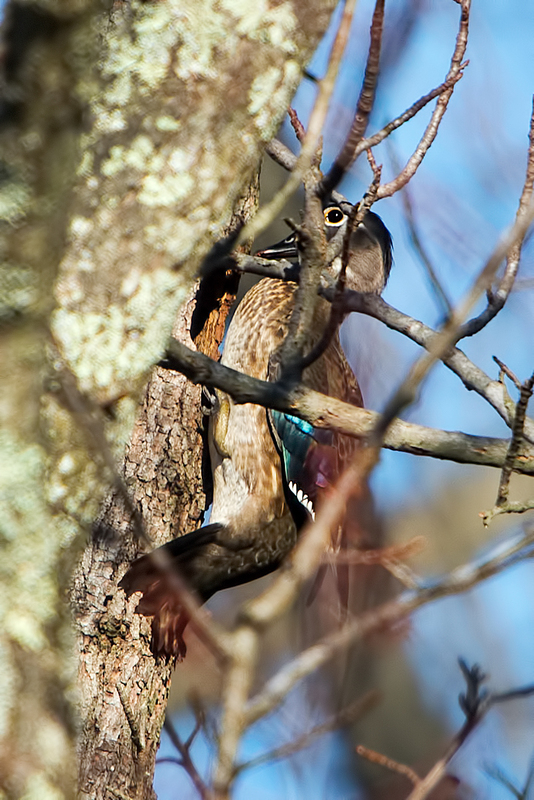 That is when Wood Ducks inspect potential tree cavities for nesting and what the first pair of Wood Ducks that I saw were doing. I later observed the same behavior, and at both times, the tree cavities were far up in the trees, at least 75 feet. Below is a pair of ducks high up a very large tree, and the male can be seen watching me closely, as the female poked her head out of a possible nest. Their nests are typically close to the water. 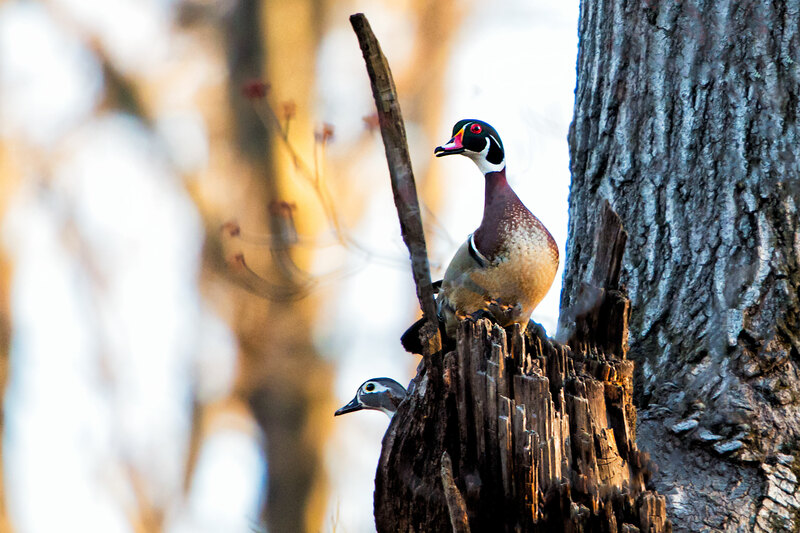 Females lay between 7 – 15 eggs, and Wood Ducks that live in the south often raise two broods per season. 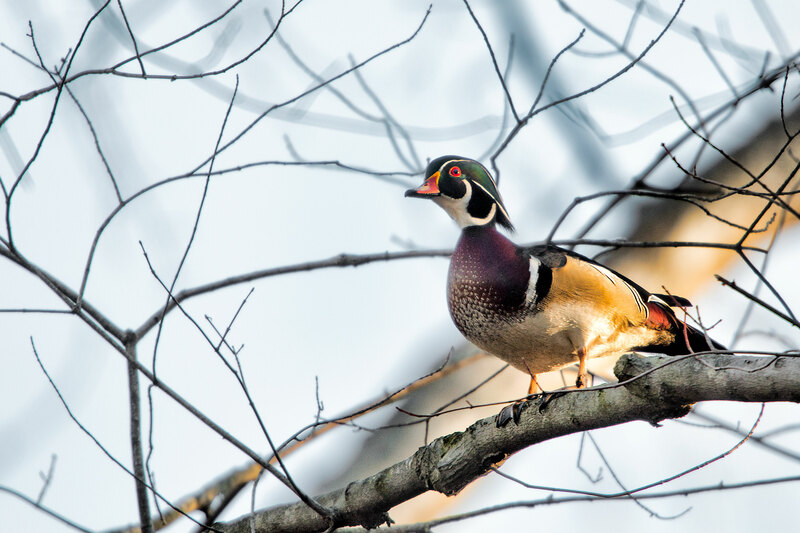 Did you know that Wood Ducks spend a lot of time in trees and nest in trees? They are one of the few ducks that are well adapted for tree dwelling. Their webbed feet are equipped with strong claws that enable them to perch on trees and grip bark. If Wood Ducks use tree cavities high off the ground for nests, do you know how their young ducklings get to the water after hatching? They claw their way to the cavity entrance and jump. Wood Duck ducklings can survive falls of almost 300 feet, uninjured. When they land on, or I should say fall to, the ground, they scramble to the water. What a way to be welcomed into the world. 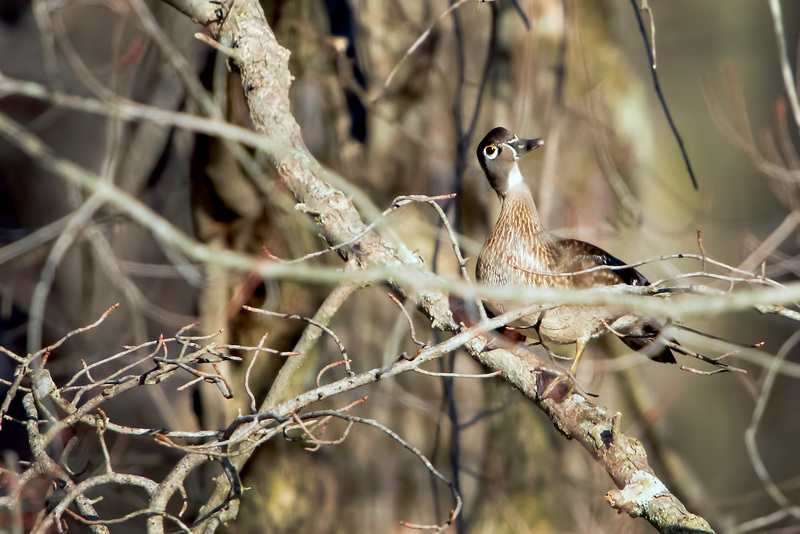 As you can see from the images in this article, I had some success in photographing Wood Ducks at Huntley Meadows last weekend. However, today was disappointing. 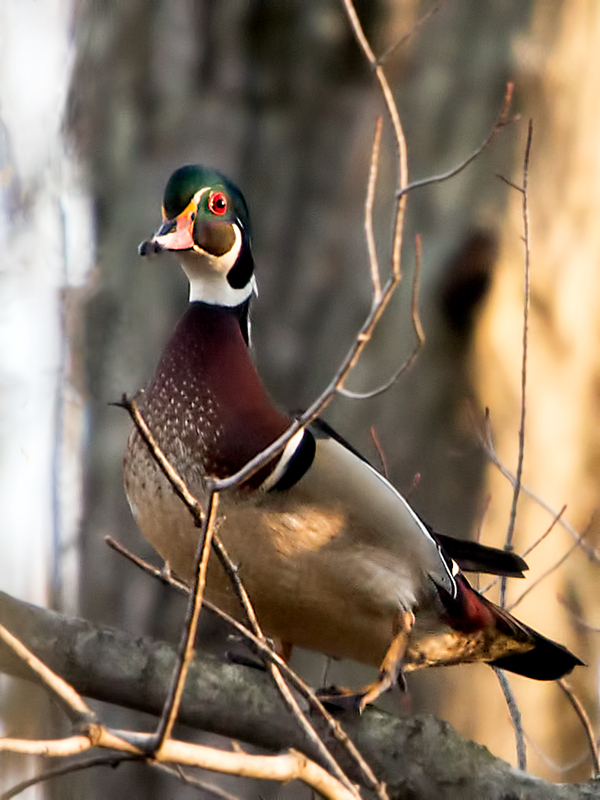 The one Wood Duck that I saw was a female, and she flew deep into a heavily wooded area about the same time that I saw her, which was fine, since a photograph of a duck on top of a nesting box was not what I was after. The following images are of a male and a female Wood Duck, and although thankful to have captured them, they are not perfect, but better than what I got today…nothing. What helps to “make” these images, and those above, is that the trees do not have leaves yet, making the ducks stand out and their coloring more striking. Regardless, it was still very difficult to locate the ducks and get these images, because of the many trees and branches obstructing my view in the heavily wooded forest. To say I am excited about finding Wood Ducks and getting some decent images of them is an understatement, but what excites me more is the potential to photograph the Huntley Meadows Wood Ducks over the next few months as they continue to nest and raise their young. A perfectly exposed and tack sharp image of a male and female Wood Duck followed by a group of ducklings composed in a natural setting would be the image to achieve my Wood Duck photography goal. When I get that image, it will posted on my blog within hours. The images in this article were photographed with a Nikon D800, using a Nikkor 600mm f4 VRII lens and TC14 Teleconverter and mounted on a Wimberley gimbal head and Gitzo Mountaineer tripod. This entry was posted in Bird Photographs, National and State Parks, Nature, Wildlife and tagged Coopers Hawk, Hooded Merganser, huntley meadows park, nature, Red-winged Blackbird, Wood Duck. Bookmark the permalink. Wow, this is too cool ! 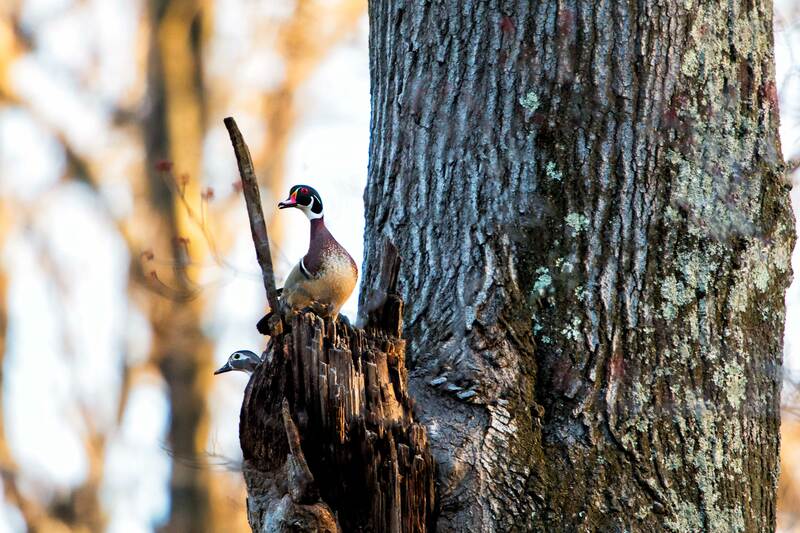 I had no idea that wood ducks can live in trees. Wonderful captures and worth the trip. Thank you for following my blog and your comment. It sure seems odd seeing ducks in trees. I know ! I almost didn’t believe it with my own eyes. Love these images! What a beautiful duck and I can’t wait to see if you can capture their young. I really enjoyed reading this post. Knowing how far away these birds were and all of the clutter between them and you, these outstanding images are a real testament to your skills and equipment. Hopefully in several weeks we will see a bunch of their prodigy swimming around learning how to be extremely evasive to photographers. Thanks Ernie. When are we going again? Yes Steve, it’s very easy to see why you are excited to have captured these images. What a thrill for us all – seeig these. Like the other comments, can’t wait to see “families” – later. And to think “this” has been going on for ages without our knowledge or understanding of Nature at its Best; coupled with the extraordinary skill of the photographer who has diligently recorded these spectacular events. Kudos. Gorgeous photos! It’s especially interesting to see them perched in the trees. Thank you for sharing. Thank you for reading my blog article and comment. I have seen Wood Ducks in the water, but this was first time in trees and very high up besides. I am amazed to find out that these ducks inhabit trees! I’ve never seen them in the wild, only in zoos. Their colors are mesmerizing. I hope you get “the” shot you’re after; I’ll be watching and waiting to see. It does seem unusual to see ducks in trees; now, I not only look for them in the water, but also high up in the trees. Once the young hatch and hit the water (or ground and work their way to the water), the adults stay in the water with them. That should be easier on my neck, and I sure hope to see and photograph them on the water in about a month.